After the release of the Telstar (the first "dedicated-chip" pong system) in 1976 which was a big success, Coleco conceived a whole range of pongs for release at Christmas 1977. 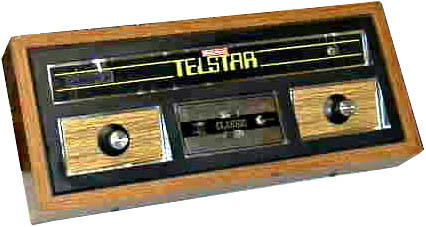 This pong is identical to the original Telstar but with a big deluxe wooden frame. There's a 3 positions switch that controls difficulty (beginner : slow ball, big paddles / advanced : fast ball, big paddles / expert : fast ball, small paddles). If this is common to the first Telstars, this is quite different from most of the other pong systems which offer individual settings. see more Coleco Telstar Classic - Model #6045 Ebay auctions !